Both Tim and I have had the HTC One (M8) in our possession for 24 hours now. We have taken the phone through an unboxing and quick tour, showed off the Dot View Flip Cover, and are deep diving into preparations for a full review. But before we get there, all sorts of initial thoughts have run through my mind about this 2014 flagship from the Taiwanese manufacturer that I wanted to share. Some good, some bad. Below, since this is by no means a full assessment of the phone, I’ve put together a bunch of quick hitters that touch on things like the randomness of HTC using “(M8)” in the name, how much I love on-screen buttons, and how confusing it is that HTC and Google want you to pay $699 for the Google Play Edition. We’ll have more later, but here are some initial thoughts. What’s with the name? Since when do we use codenames in official product names that consumers see? “2014” or “new” wasn’t good enough? We had to go M8? Talk about the potential to be confusing to everyone involved. Is it the One or the M8? Is it both? No one would have complained if the name just stayed “HTC One.” Google did it with the Nexus 7 last year, as has Apple in the past with the iPad. It worked just fine. Preparing to be disappointed by the camera. We are far from finishing up our testing of the M8’s camera, but I’m not going to lie – I’m super skeptical already, bordering on expecting to be disappointed. HTC gave us the same 4MP (“UltraPixel”) camera as last year, took out OIS, and slapped on a gimmicky depth sensor, so that you can refocus photos after the fact or do really terrible 3D-shaky-processed things. Both Sony and Samsung are doing refocusing with one sensor and are also giving us a real image resolution. The shutter is insanely fast though, so there is something. Holy sh*t does this phone feel premium. I mentioned this in my unboxing yesterday, but the minute you pick-up the One (M8), you are guaranteed to notice the quality. I keep referring to it as mobile luxury. No other phone on the planet feels as premium as this device. The soft curves, the all-metal body, the fine lines, the color, all make this the prettiest and most well built phone I’ve ever touched. But why is this phone so damn tall? As premium as it feels, though, this phone is way too tall. It’s almost a full 10mm taller than the original One, which I’d argue was already too tall of a phone. I’ve had to adjust the way I hold a phone with the M8, because there is a constant need to shimmy to get to the notification bar. On-screen buttons! 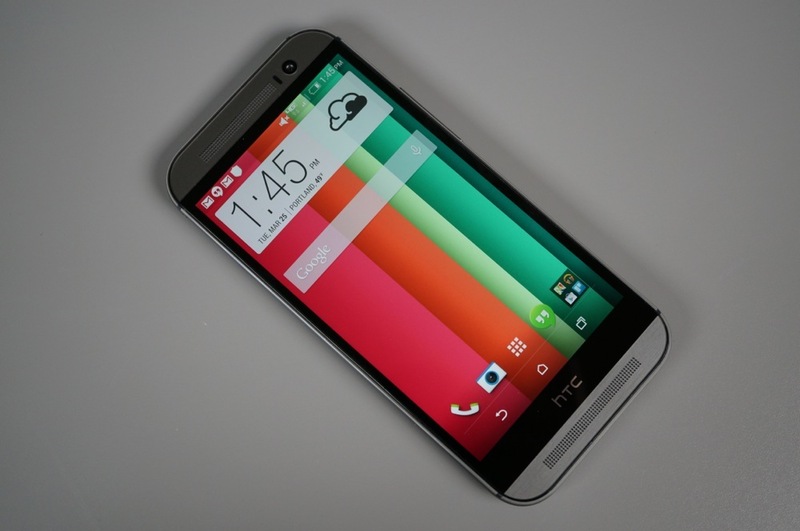 HTC failed miserably last year with its capacitive Home-Back button setup on the original One. It was confusing and required too many double taps or long presses to get anything done. With on-screen buttons on the M8, it makes the phone feel like it’s actually running Android and meets some of Google’s vision for the operating system. Headphone jack on the bottom! Yes! Finally, someone else gets it (or had to for engineering purposes). A headphone jack on the bottom of a phone is one of those design tweaks I will praise until the end. It makes sense for when you put your phone in your pocket, for when you are holding the device in hand and listening to music, and also if you use your phone in the car. Thank you, HTC! micro SD slot! One of the first things I did yesterday upon opening my One (M8) from Verizon, was slap in a 128GB micro SD card. Why? Because why not? In a time where Google is trying to convince everyone to kill off the micro SD slot, HTC went ahead and brought it back. Screw the cloud. Gestures are awesome, but let me customize them. One of my favorite features of the M8 is screen-off gestures. With the phone in an off state, you can double tap to wake the screen or swipe in a variety of directions to get into BlinkFeed, launch a voice dialer, and unlock. I just wish HTC would let us customize them. Think if you could set swipes to open specific apps or launch something like Google Now? Let’s do it, HTC, the infrastructure is already there. BoomSound needs to be in all phones. Do I need to say anything else? The One (M8) – like the original One – is a portable speaker with a phone attached. The sound it produces, is simply amazing for a phone. That display tho’. 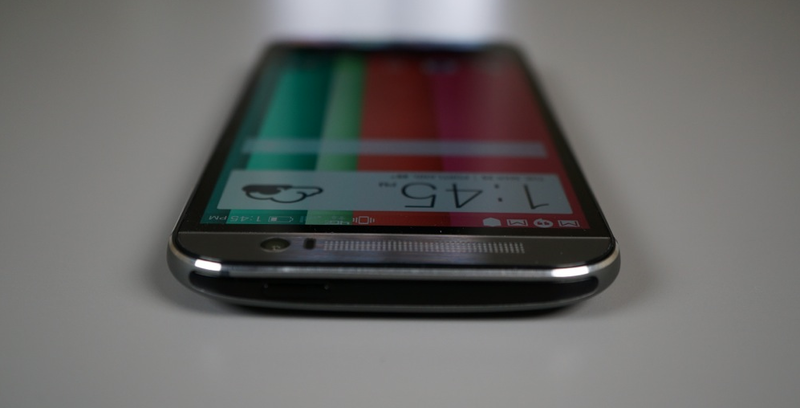 The 5-inch Super LCD 3 display on the One (M8) is gorgeous. Colors pop without looking cartoonish, viewing angles are amazing, text is crisp, and there isn’t a pixel to be seen. Google Play Edition price, lulz. Seriously, $699 for the Google Play Edition? It’s like HTC is giving you a discount for the Sense version, which is the version they put all their hard work and energy into. If you want the phone with all of their efforts removed, that’ll cost you more! Ridiculous. Still liking BlinkFeed, I know, I’m weird. After all this time, I still like BlinkFeed. The new version is much prettier than the last, has more apps I like that can be added into it, and still gets me easily digestible news and information without much effort. Great job on availability, HTC. Terrible job with the leaks, HTC. HTC should be given props for making this phone available on all major U.S. carriers from day one. They should also be given major props for making the phone available in store at Verizon on day one. With that said, since they waited to announce it until it was ready to ship, it leaked left and right. There were zero surprises yesterday even though their marketing team kept telling us to wait to see the truth and not believe everything on the internet. This was one of those cases where the internet was 100% right. HTC is so close. This phone is not the perfect smartphone. I know that within the first day of using it. It seems like a really great phone – potentially one of the best ever made – but it’s not perfect. There are trade-offs with the camera, plus the size can be a bit overwhelming. We’ll have more on that in the full review. For those who picked this phone up already, do you have any thoughts to share?